I have held forth on the party in a top many, many times, but for those of you who are new to the notion, I arrived at it one December when I noticed that holiday parties are usually so crowded that all anyone notices is what you’re wearing from the waist up. 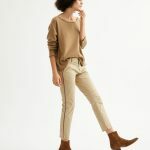 Get yourself a good top, pair it with jeans or trousers or a skirt—depending on the formality of the occasion—and you’re set. I can’t 100 per cent prove that this little theory of mine is fact, of course, but if nothing else, it can make dressing up to go out a whole lot simpler. I’m starting out with a rather subdued choice, because I really like the ruffles at the neckline and I hardly ever like ruffles. But mostly my taste in parties in a top skews a bit louder; this zebra-print button-down is a case in point. 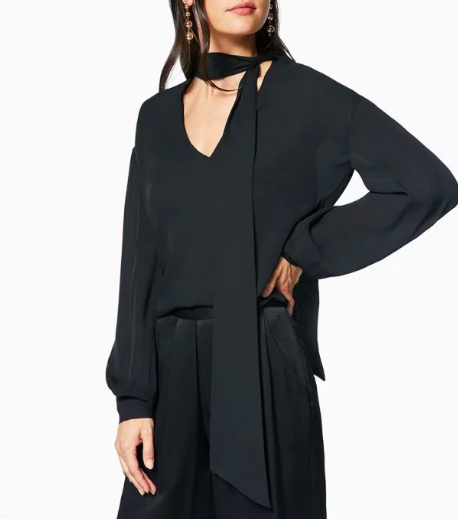 A tie-neck and plunging neckline make this choice a nicely dramatic one. I’d wear a slightly more delicate camisole under this sheer top. 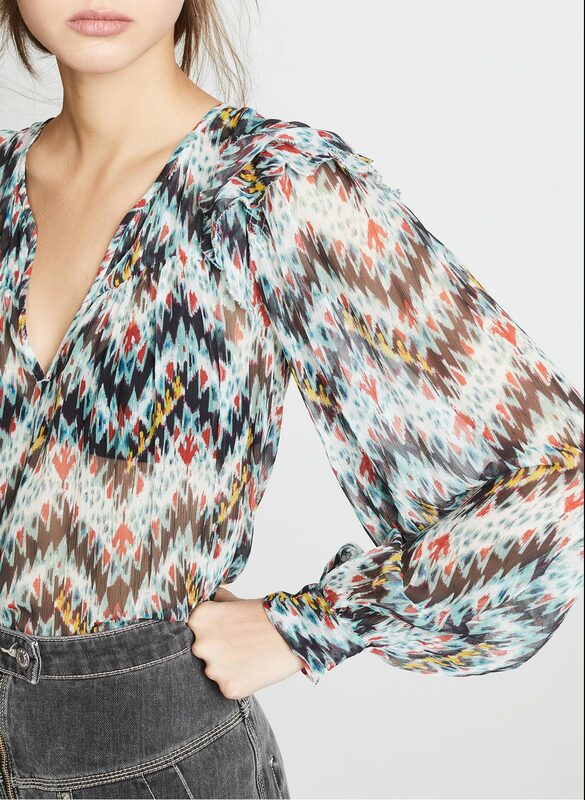 I’d wear this gorgeous print with a velvet skirt and big hoop earrings for a restrained boho look. Sometimes, a bold party in a top is just the thing. 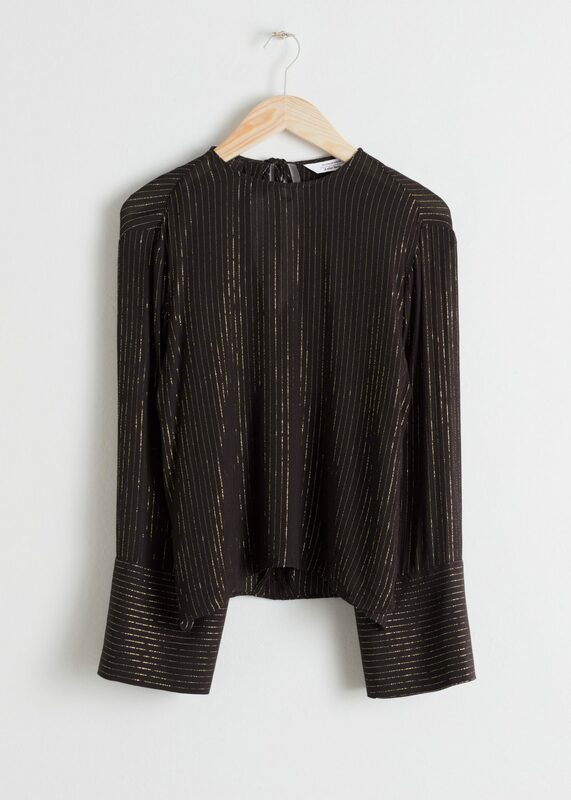 How cool would this paillette-festooned top look peeking out from under a blazer? 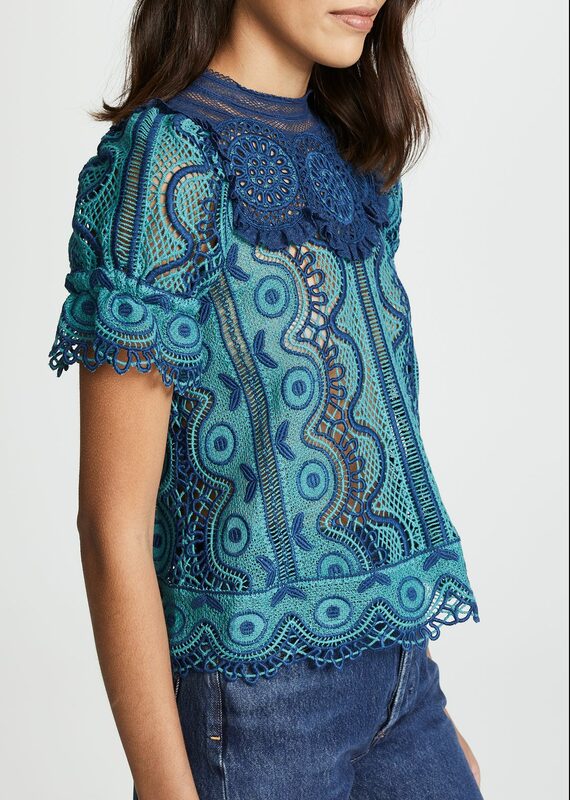 This lace blouse is so unexpected in shades of blue. Metallic pinstripes are just bold enough to make a statement. 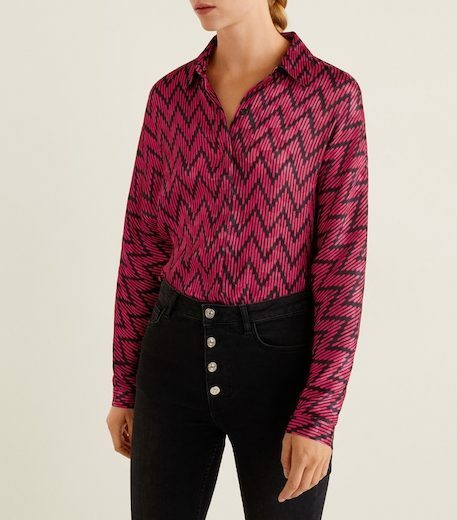 The twisty neckline reminds me of something you’d see on a Vince top, but this is from Mango (and is available up to size 10; I have heard your complaints about Mango’s sometimes constricted size options). 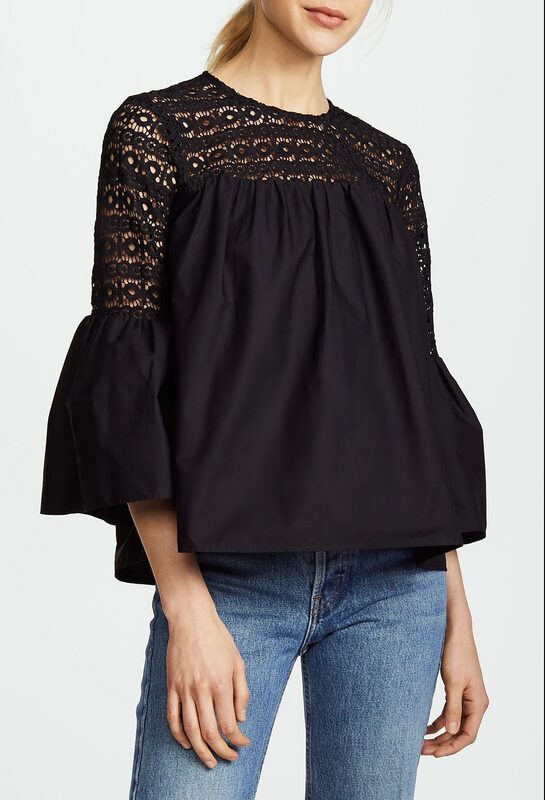 This is like if a tuxedo shirt and a peasant top had a baby. 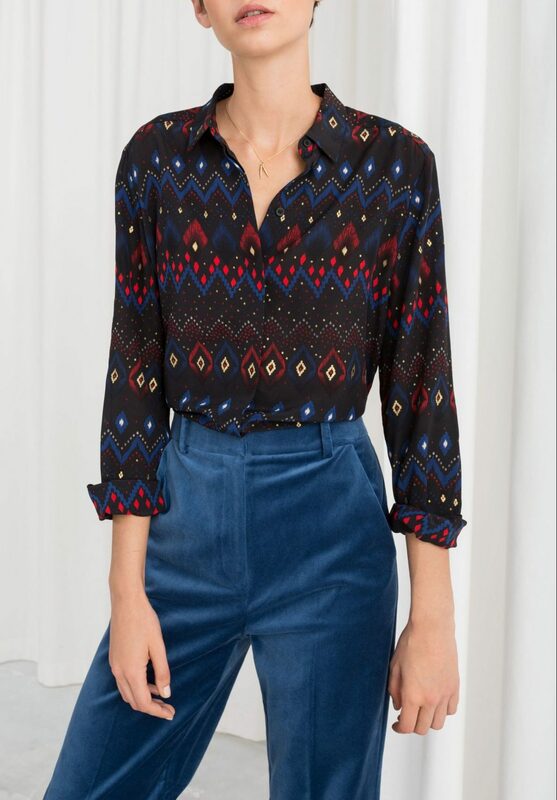 A pleasingly loud print on a well-priced silk shirt. This just drapes rather prettily, and I dig the blue snakeskin print. 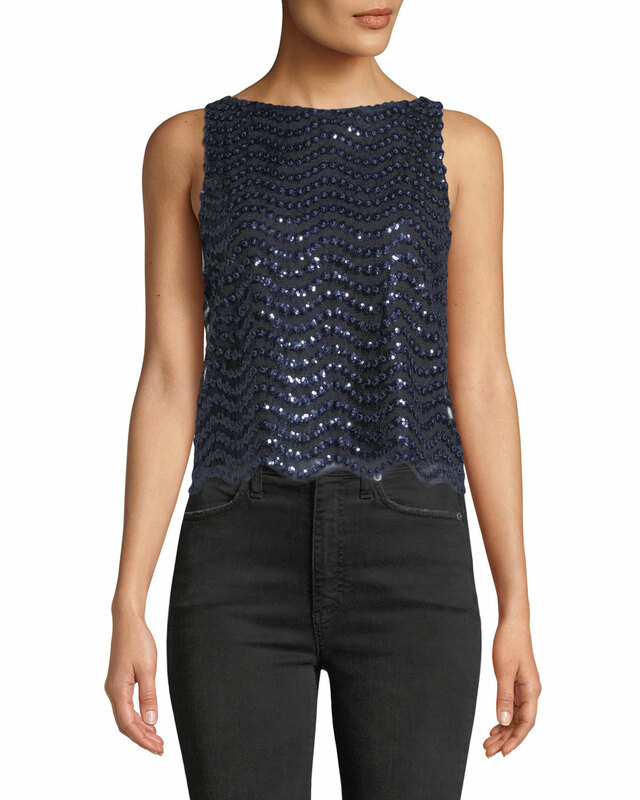 I could not be more in favor of sequins—especially dressed down with jeans—and like how just off-the shoulder this top is. 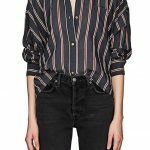 I’d unbutton the top few buttons here and wear this with a cami underneath. 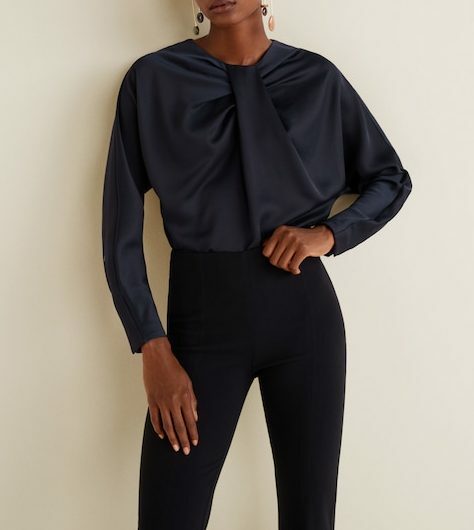 This Zero+Maria Cornejo top is a splurge, to be certain, but it is so damn gorgeous, and I think you could dress it way up or down. It’s from 11 Honoré, a fantastic site offering extended sizes from big-name designers. More sequins, this time on a slightly (and appealingly) retroish tank. 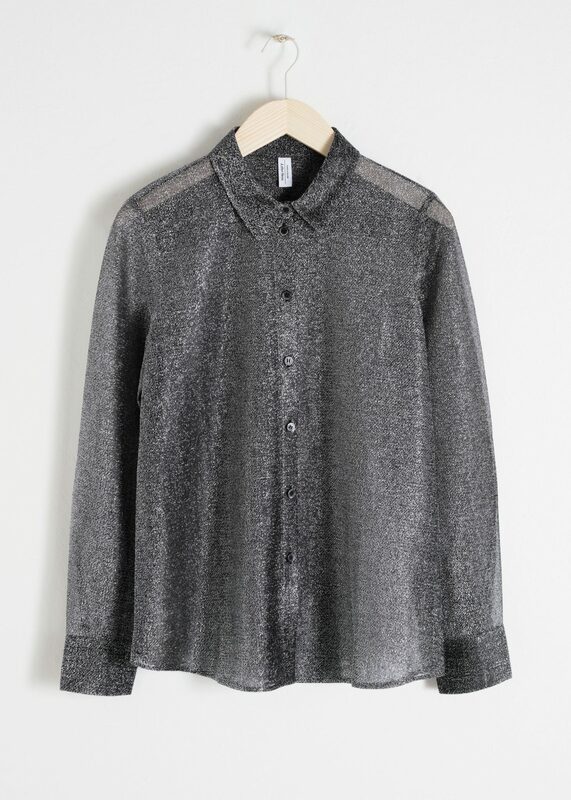 This lurex button-down would likely be itchy as all get-out, but I think it’s fun. Red and black is bold without being overwhelming. And finally: I just really like the ease of this choice. 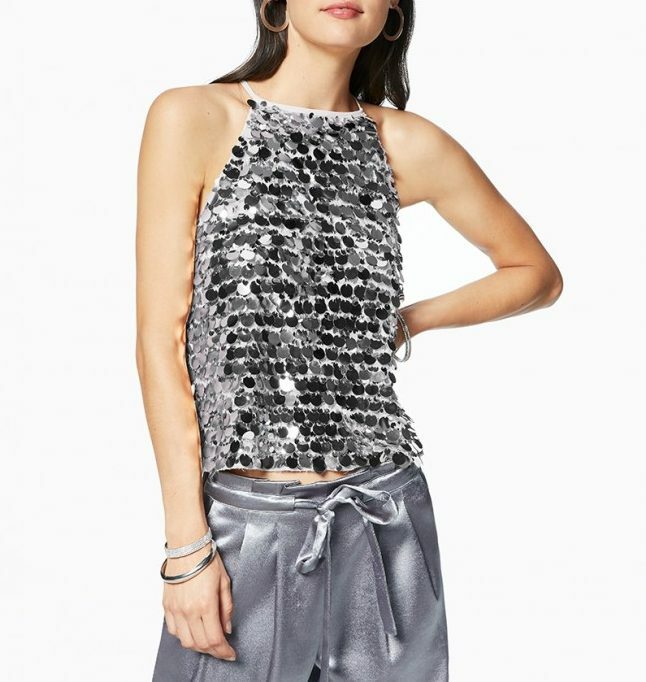 If I had a fancy (or even not so fancy) party/event to go to I would be decked in one of these sequined tops. I don’t know why I’m suddenly all about the sequins, but I am. (Which means I’m turning into my muther so I’ll probably be full-on shopping at Chico’s by spring.) This holiday season is going to be a quiet one for a variety of reasons and I’m fine with that, but I may have to work in a sequined top even if I’m just meeting someone for coffee! 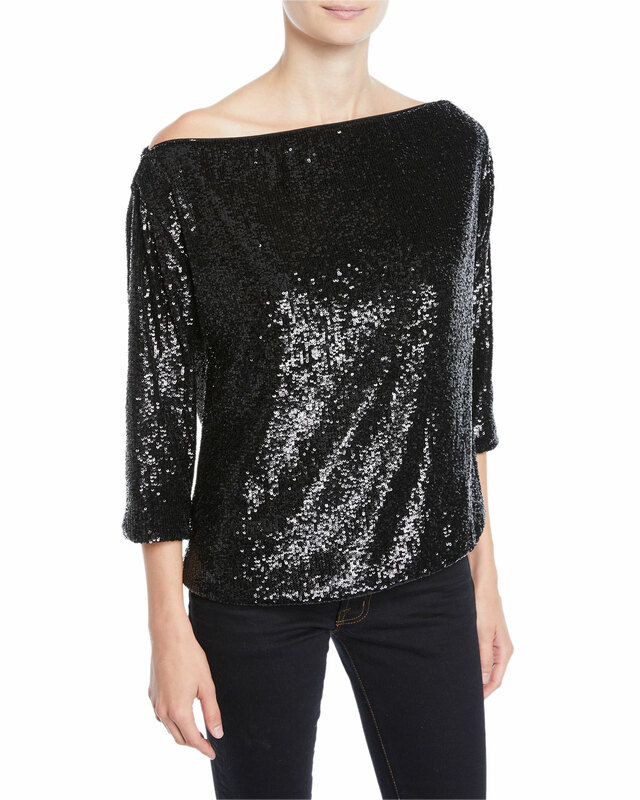 If I had a fancy (or even not so fancy) party/event to go to I would be decked in one of these sequined tops. I don't know why I'm suddenly all about the sequins, but I am. (Which means I'm turning into my muther so I'll probably be full-on shopping at Chico's by spring.) This holiday season is going to be a quiet one for a variety of reasons and I'm fine with that, but I may have to work in a sequined top even if I'm just meeting someone for coffee! Chico’s has really skewed to a specific demographic in recent years – their own set of girls of a certain age. My lovely 85yr old stepmother used to be a frequent flyer there but was turned off when they went way animalistic and sparkly. She favors a classic look and is a big fan of Talbot’s. Chico's has really skewed to a specific demographic in recent years - their own set of girls of a certain age. My lovely 85yr old stepmother used to be a frequent flyer there but was turned off when they went way animalistic and sparkly. She favors a classic look and is a big fan of Talbot's. I avoided Chicos like the plague for years, but recently have gone into the one in my local mall (which is dying and Chicos is one of the only stores left) and found a couple of nice things including a leopard print shirt that fits well, the fabric is lovely and didn’t cost an arm and a leg. I also bought a black shift dress with zippers that is really cool. I agree that a lot of their clothing is way too “plays slots in Vegas” but I have found a few gems. I avoided Chicos like the plague for years, but recently have gone into the one in my local mall (which is dying and Chicos is one of the only stores left) and found a couple of nice things including a leopard print shirt that fits well, the fabric is lovely and didn't cost an arm and a leg. I also bought a black shift dress with zippers that is really cool. I agree that a lot of their clothing is way too "plays slots in Vegas" but I have found a few gems. I have been WAITING for party in a top! Thank you! Oh so many wonderful tops!! I do not have a fancy party to go to this year, but would definitely wear the zebra print to watch the remaining football season in from my couch. And Like c.w., I would wear the sequins to have coffee……and when reading GOACA. Oh so many wonderful tops!! 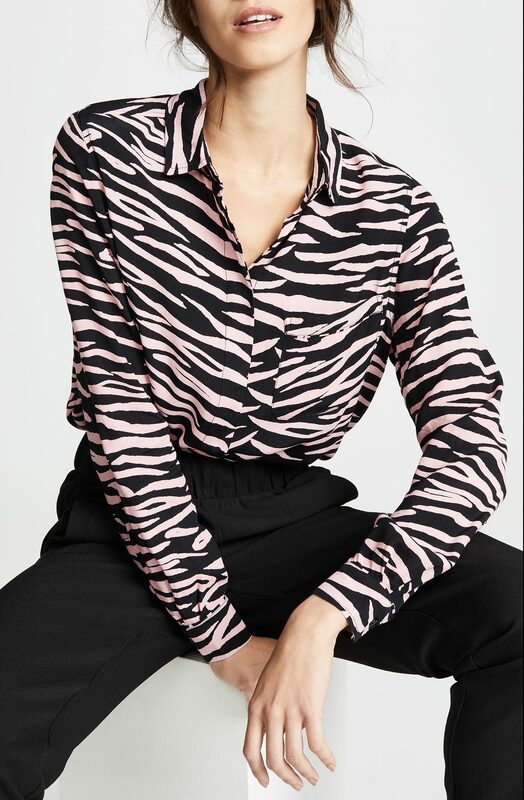 I do not have a fancy party to go to this year, but would definitely wear the zebra print to watch the remaining football season in from my couch. And Like c.w., I would wear the sequins to have coffee......and when reading GOACA. I work from home and get dressed up regardless. I joke about how I’m ready to party at Trader Joe’s or at kid’s carline. It’s all for me, baby! Anyhow, love-love the Mango top. 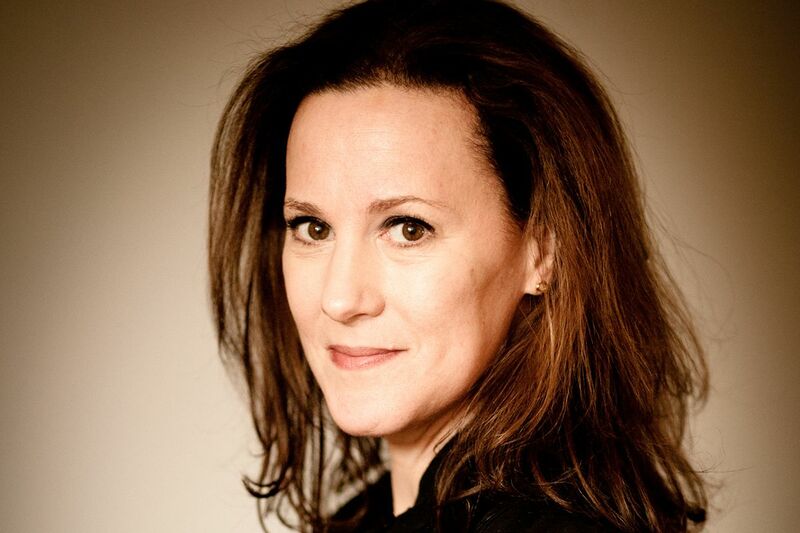 But it’s cropped…GRR! I work from home and get dressed up regardless. I joke about how I'm ready to party at Trader Joe's or at kid's carline. It's all for me, baby! Anyhow, love-love the Mango top. 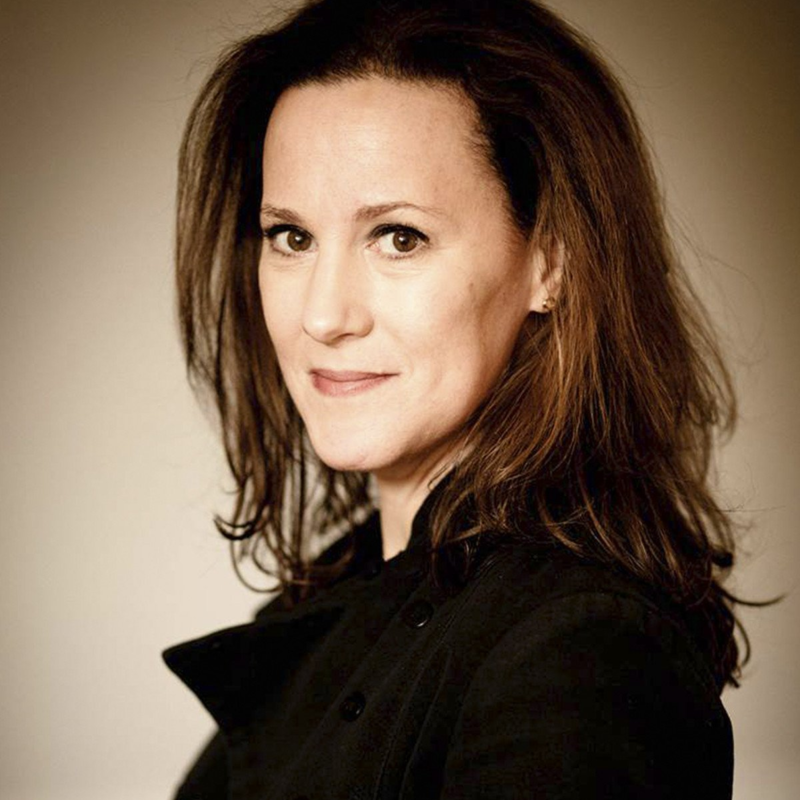 But it's cropped...GRR! It occurs to me maybe we should be throwing more parties? That would be one way for me to get invited to one. I don’t really have a space. Still, maybe I can come up with something creative. Hmm.